Главная / Английский язык / Would you like to be healthy? 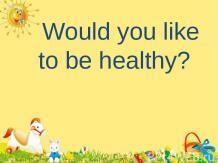 Презентация на тему: Would you like to be healthy? Eat carrots , apples and cabbage. Have porridge, cheese and milk for breakfast. Drink juice every day(каждый день). Do not eat many sandwiches , sweets and cakes. You must wash(мыть,умываться) your face and hands. You must clean(чистить) your teeth every day. You must run in the morning..
You must skate and ski. You must swim, skip and jump. You must play football or tennis.. Walk and play with your friends!